The SparkFun Inventor’s Kit for micro:bit is a great way to get creative, connected and coding with the micro:bit. 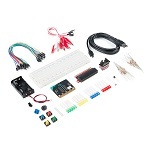 This kit provides not only the micro:bit board but everything you need to hook up and experiment with multiple electronic circuits. This kit will allow you to experiment and learn how to read sensors, move motors, build Bluetooth devices and more. 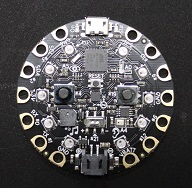 The micro:bit itself will be surprised at the amount of hardware each board is equipped with, including 25 red LED lights that can flash messages. There are two programmable buttons that can be used to control games or pause and skip songs on a playlist. The micro:bit can even detect motion and tell you which direction you’re heading. 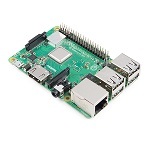 It can also use Bluetooth Low Energy (BLE) to interact with other devices and the Internet.